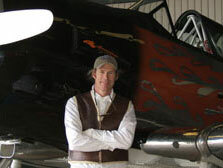 Welcome to Kevin Kegin’s American Warbird. Come fly an authentic American Warbird. You will actually take the controls and fly this fighter plane for the most exciting experience of your life! From St. Louis, Missouri, Kevin is a Pilot and Mechanic – Commercial (single / multi engine airplane, instrument airplane) and Certified Flight Instructor (single engine airplane). Kevin is also an Airframe and Powerplant Mechanic with Inspection Authorization. He has barnstormed biplanes, towed banners and built F-18’s for McDonnell Douglas. Kevin has over 10,000 hours, 7000 or so in the AT-6. Copyright © 2013 Kevin Kegin's American Warbird. All Rights Reserved.